…I don’t get what’s so “controversial” about a very small child. One of the things Heroic Media wanted to get across was what life looked like at 20 weeks, which is the legal threshold defined in the pro-life bill that passed the House recently. They wanted to impress their viewers with how much of a baby a baby really is at 20 weeks. I see two reasons why it could be “controversial”. One is because of its obvious political agenda, which conflicts with the equally obvious political agenda of the papers in question. The other is because it is not clear whether the child is real or a model. 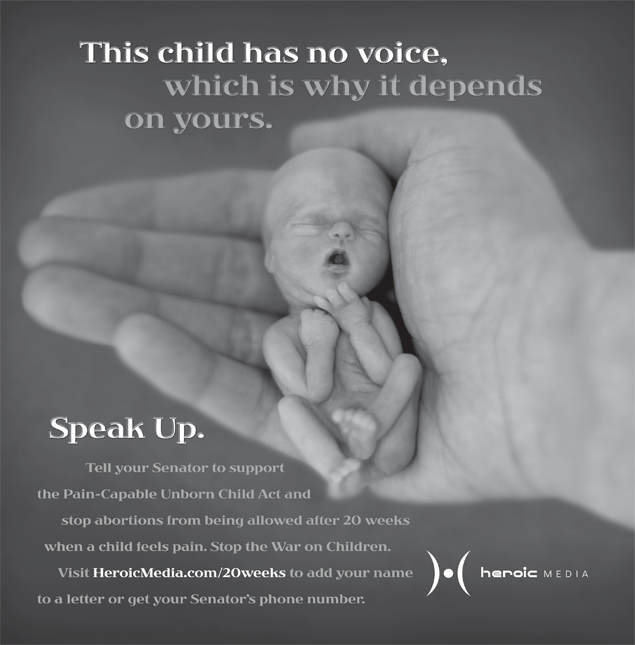 This morning Heroic Media’s executive director Joe Young informed me that the Chicago Tribune agreed to run an alternative ad today, displayed above, which shows an ultrasound image of a 20-wk-old baby, obviously en utero. Meanwhile, the LA Times and USA Today rejected the second ad as well. It’s obviously impossible to know just how far politics is involved in the censorship, but I do think it would be appropriate to label the child-image as not a model, not a real child. It would be wise for newspapers to have a policy – one that can be uniformly applied to all – designating how ambiguous images should be treated. I don’t think the ad should have been censored, but I do think it would be entirely appropriate to demand that the ad label (very small print is ok) whether or not the image is of a real child or a mock-up. The newspapers in question could have avoided some bad publicity if they’d already had such a policy in place, and could simply point at the rules and say “nothing personal”. “Our hope is that the American public begins to advance this debate with both the mother and child in mind,” Young said. Heroic Media is a non-profit whose mission is to educate the public in general and reach women facing unplanned pregnancies with life-affirming alternatives through the use of mass media, such as television commercials, internet outreach, and billboards. “This issue, the late-term killing of developing children, is one that should be addressed in the U.S. Senate, and we encourage our fellow citizens to let their Senators know our desire to see that happen,” Young said.